evoluzination: Linked. How everything is connected to everything else. Linked. How everything is connected to everything else. This is the title of a great book by Albert-László Barabási. 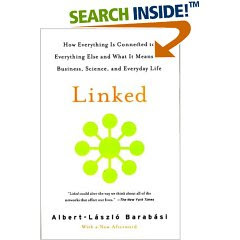 The book narrates the history of networks from its origins around the eighteen century conceived as simple random graphs, growing to explain the complex networks we see today in every day's world from molecules to genes to neurons to the economy and the web.
. Small worlds, there exist a small limited degree of separation between any two nodes. In other words, given any person in the planet, there are an average of six other people needed to reach any other person. The same is true for web pages in a number of 19. This property has become controversial lately (why can't be find Bin Laden if we live in a small world?) as a potential but not always a achievable property as it depends on the nodes cooperation and intentions.
. Hubs and connectors. Nodes are not randomly connected. There is a rule called the 80/20 rule (80% of the links are concentrated by 20% of the nodes), which establishes that some nodes concentrate links and act as connectors in the small worlds.
. Richer get reacher. These networks follow a power law distribution curve instead of a bell curve like a random network would. The reason for that is that new nodes attach to the network not in a randomic way but they follow the principle of preferential attachment. An example of this principle applied to the web would be that when choosing between two pages one with twice as nodes as the other, about twice as many people link to the more connected page.
. Survival of the fittest. Nodes always compete for connections because links represent survival in an interconnected world. Fit-get-rich is the rule, although some networks stop being scale free networks when winner takes all. This book written in 2003 mentions as an example the case of the Operating Systems area with a single hub and many tiny nodes. Interestingly enough, it mentions Google not being a winner takes all ... so far ... Anyway, fitness distribution might predict winner-takes-all behaviors.
. Achilles heel. Robustness is an emergent property of these networks, as the higher the interconnection and distribution the more guaranteed is their robustness. The Achilles heel are the hubs, a network could be bring to their feet just by damaging a few key nodes, its hubs. Anybody that has ever been stuck in Chicago airport knows what it means.
. Topology can be centralized (known as spider), decentralized (known as star, the internet for instance) or distributed (mesh like), the optimum and least vulnerable one, although not achievable for the internet or the web which took a live of their own.
. Fragmentation. Tendency to form communities shaping continents and islands. This explains why it's so hard to find some documents in the web with our current tools. One of the last questions left open in the book is: as the planet seem to be evolving into one vast computer made of billions of interconnected processors and sensors, when will this computer become self-aware? Neuroscientists are kind of asking the same question in retrospective, how did we humans become aware as the result of our sensorial and neural networks? Without a doubt one of the deepest questions of this century. Loved this little book, it has implications for all sorts of networks ranging from the genetic world to economics and the internet.